MERITON Suites were awarded 5-star status at another two of its locations by Star Ratings Australia. Meriton Suites Church Street, Parramatta and Meriton Suites Pitt Street, Sydney were announced as the newest, officially accredited 5-star accommodation options in their respective areas. 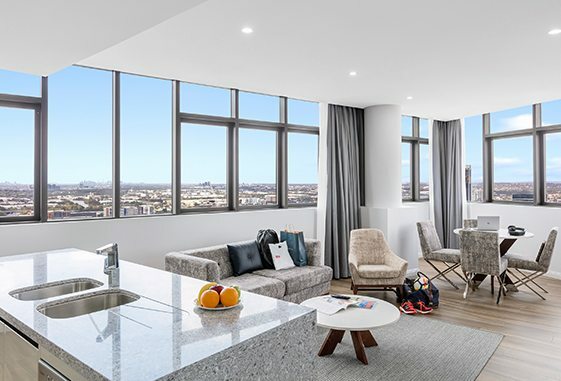 Meriton Suites Church Street debuted as the tallest hotel in Western Sydney and now features as the newest and only 5-star accommodation option in Parramatta. Matthew Thomas, Group General Manager of Meriton Suites says that it’s imperative that the brand showcases an impressive degree of 5-star services to accommodate the global expectations guests have whilst on their travels. This 36 level, all-suite hotel features the finest of furnishings in all 254 fully-appointed suites, along with state of the art recreational facilities that include an indoor heated lap pool, a spa and sauna, a 24-hour fitness centre with exclusive access for guests, as well as an outdoor, riverside podium pool and sundeck. The second Meriton Suites property to be awarded 5-star status this year is Meriton Suites Pitt Street, in the heart of Sydney’s CBD. Following its full re-modelling project, completed across all 179 luxury suites earlier in the year, this Sydney CBD hotel has been officially rated as the city’s newest 5-star accommodation option. Featuring oversized studio, one, two and three bedroom suites, as well as 2 top floor, luxury Penthouse Collection Suites, all of which showcase a new generation of interior design, Meriton Suites Pitt Street provides travellers with the utmost in comfort, along with above and beyond services to raise the benchmark in travel and accommodation standards within Sydney. Positioned right in the centre of Sydney CBD, this hotel demonstrates ultimate convenience, with the top of the city’s attractions, including Darling Harbour, Sydney Tower, Pitt Street Mall and Circular Quay all within walking distance, while public transport such as Town Hall Station and major bus routes are only seconds away. Meriton Suites also offers complimentary unlimited, high-speed Wi-Fi from all suites and areas of every hotel, as well as refined services such as ghd hair straighteners upon request, Vittoria coffee machines and bespoke bedding at all 17 locations across Australia.